In Greek mythology, Daedalus was a brilliant craftsman and engineer. ...But Daedalus is perhaps best known for the invention of flight. Imprisoned in a tower with his son, Icarus, Daedalus fashioned wings out of feathers and wax. As they planned their escape, he warned Icarus not to fly too close to the sun for fear that the wax would melt. Once they were in the air, though, Icarus ignored his father's warnings. He soared exuberantly into the sky. His wings fell apart, and Icarus fell to his death. This story is often interpreted with a moral for children: Obey your parents. Rein in hubris. But there is also a timeless lesson for grownups: Brilliant technology is not enough to save us from ourselves. Tech proponents will insist that Daedalus needed wings to escape. Tech skeptics will say that Icarus would have been better off without them. But had Icarus exercised restraint, or had Daedalus taken more time with his son to convey the risks, they could have benefitted from the technology without the tragedy. The real lesson, then, is not about technology at all - it's about the right kind of heart, mind, and will. These types of issues are really common (as well as costly): the failure of One Laptop Per Child; a sophisticated home energy feedback system that has no effect on actual energy use; an expensive college advising support system that doesn't actually improve student outcomes. After reading about as well as seeing these issues first-hand at ideas42, I eventually realized something: we shouldn't think of technology as a solution - we should instead think of technology as a medium for a solution. That is, it's not enough to create a stunningly advanced product and hope for impact. Instead, there needs to be a fundamental understanding of human behavior built within the product. We need to know and design for how the product will actually be used. Tough Habits: Quick - when flushing a toilet, which way do you press? Up or down? That's right, down! Because the above handle copies an already-existing simple toilet lever design, we have a pre-existing habit to press down when we see something like this. And unfortunately down is also the dual-flushes' larger flush. The problem here is that habits are incredibly hard to break, particularly if the user is in a hurry (like you may be when in a bathroom). Because people aren't used to pulling a toilet handle up, the less water-intensive 'up' flush will require people to make an active choice, every time, until it becomes habitual (which might never happen). An Attention Problem: Regarding those instructions - no one is going to read them (people's attention is surprisingly limited - we spend on average about 1/10th of a second looking at nutritional information per item, for example). From the founder of human-centered design, Don Norman: "When external signifiers - signs - have to be added to something simple, it indicates bad design." This one didn't include wall-mounted instructions, which was a good start. But there's something funny going on here. I'll give you a hint - look at the paint. This is important because it demonstrates a norm of behavior: If everyone uses this option, it must be good. And behavioral research tells us that social cues tend to have a significant effect on our preferences and actions (for more, check out this fascinating study). Perhaps this is the first time that you're using this dual-flush, or maybe you're in a rush and the design doesn't seem that intuitive. Whether subconsciously or consciously, the worn down paint may pull you to use that option (and a lot of research has been done regarding the effect that social cues have on changing environmental preferences, as well). The lesson with this one, then, is to be careful about the signals that technology gives to its users. 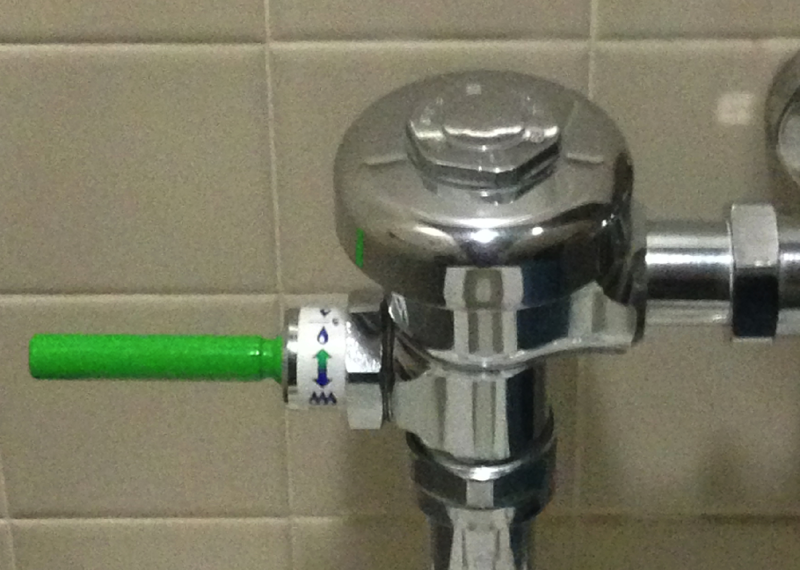 The designers were likely trying to push users to the less water-intensive option by making that button green. And at the same time, they were using signals to make it intuitive (small button with one water droplet for the lighter flush). But the wearing away of the paint also erodes the quality and effectiveness of the intended signals by unintentionally creating a new signal: the social cue of the worn down paint. I haven't seen rigorous studies on the gap between the promised water-saving potential of these technologies versus their actual savings rates, though it wouldn't surprise me if we eventually learn that the gap exists. 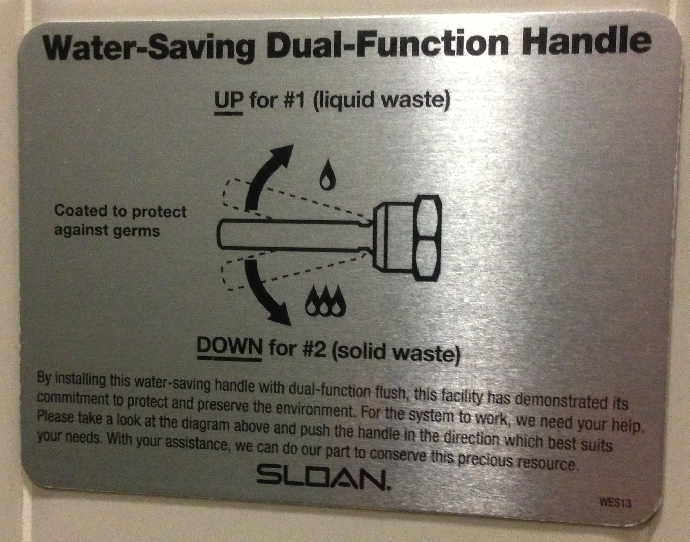 And that's okay, because these dual-flush toilets aren't likely having a net negative effect. But they could function better if they were integrated with a more complete understanding of how they're actually used. All of this is not to say that applying a behavioral perspective to the design of technology isn't already happening, of course. Those in human-computer interaction, as well as thousands of UX and UI designers out there are doing this, to varying degrees. And behavioral scientists and designers are starting to invade governments and tech companies, as well. Overall, my hope here is simple(ish): use insights from behavioral science when designing, and rigorously test the designs to understand their real effects. And perhaps through this we can achieve stronger impact - not by better understanding technology, but by better understanding the people that use technology.